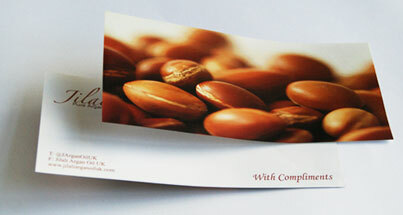 Cards Made Easy print compliment slips at the standard size of 210mm x 99mm onto two choices of superior quality paper. Compliment slips are a powerful part of your printed stationery set, much more than just slips of paper with your company logo on. They convey a sense of corporate courtesy and make the recipient feel valued as a customer. Upload your compliment slip design then pick your print & material options. Our team are on hand to create your artwork for you. As always, Cards Made Easy is so simple to use, the process is easy to follow and cards sent out as expected. 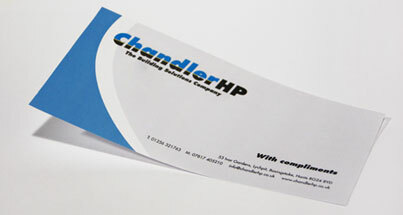 Although the traditional size of a compliment slip is 210mm x 99mm, there are no set dimensions. Some historians argue that the size evolved from that of business cards with others maintaining they are derived from the size of a letterhead. In either case, compliment slips are a popular product for building and maintaining good customer relationships and increasing awareness of your company brand. Be adventurous and dabble with a modern and friendly approach to make your slip appealing and stand out from the rest. Compliment slips can be both formal and informal and used on occasions to replace a letter of reply. So remember to leave a decent amount of white space for your hand-written notes. Some people such as Linda Hailey in her book Kickstart Marketing even suggest the majority of your slip should be hand-written to provide a personal touch. We guess that probably depends on your handwriting! What are Printed Compliment Slips used for? When compliment slips are used in a formal capacity they generally accompany a product or document as a reference to your business information and contact details. This is an excellent opportunity to increase brand awareness with your customer, so ensure the layout and content of your slip is well thought out and serves its purpose well.